We met with Nexon today and look into a few of their gaming titles. 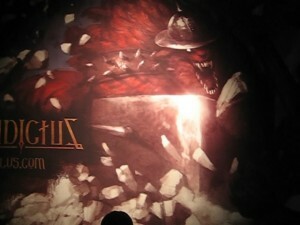 The first one we looked into is their new MMORPG Vindictus. The graphics for that game is spectacular and visually dazzling. Compare with Nexon’s previous game like Mabinogi there is no comparison. This game doesn’t just look good, it also have very smooth game play and easy to pick up controls. The controls are simple, the W,A,S,D keys are standard moving controls, while the left and right clicks on the mouse are normal and heavy attacks. This game also has an action bar which requires the pressing of number keys. Health bars are display at the very top of the screen and it seems that there is an interface option to change not only the interface but the binding of keys for easier macro. Despite the fact that the controls are very similar to a typical MMORPG, the game play in this game is much different. Most of the MMORPG out there require players to stand still to attack back and forth between the monsters. Vindictus on the other hand requires a more sophisticated style of controlling the character. Players no longer are able to home onto their enemies, but instead they will need to be more responsive in way of avoiding attacks and aiming. There is no release date for this game yet. But since its Nexon it is for certain that this will also be a free to play game. Make sure to keep an eye out on the release date of this game. This could be the new generation of MMORPG. See you there.